Join Bob The Builder™ And His Can-Do Crew For Building Fun In The Sun! 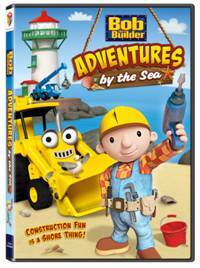 Bob and his Can-Do Crew are making waves and having fun in five new, sea-themed adventures in construction in Bob the Builder™: Adventures by the Sea, sailing onto DVD, Digital Download and On Demand May 22, 2012 from Lionsgate and HIT Entertainment. From facing fears, correcting mistakes, doing good work and always getting the job done, Bob’s the man and when you’re on his team, life’s a beach! Bob the Builder™ and his machine team "sea" lots of new ways to work together to get jobs done in and around Fixham Harbor in these five exciting stories. Scoop must make a creative seaside rescue to get the lighthouse lens shining again! Scratch realizes that admitting mistakes is the best way to be cool; the team comes to the rescue when Muck’s sandcastle compromises their big job. Scrambler shows that the key to bravery is admitting your fears. Bob and the Can-Do Crew get the job done and find success by the sea with sand, water, sun and friends! My son LOVES Bob The Builder and this was the first DVD he saw with him in it! He LOVED it and wanted to build just like Bob the rest of the day!